Pancetta is an Italian form of bacon. It is pork that has been salt cured, salted and spiced (nutmeg, pepper, fennel, dried ground hot peppers and garlic are often featured), and dried for about three months. When pancetta is specified in a recipe the unsmoked variety is intended unless otherwise stated. When served on its own, rolled pancetta is presented in very thin slices. More often it is used to flavour other dishes, especially pasta sauces. Recipes such as all’amatriciana often contain pancetta as a substitute for guanciale, which is much more difficult to find outside of Italy. 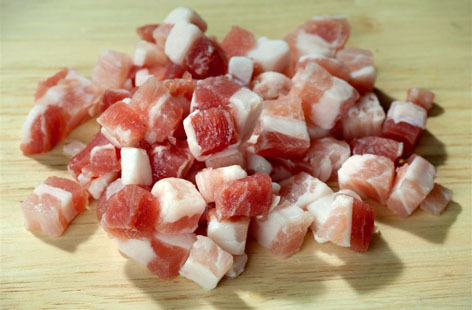 In the United Kingdom, Pancetta is more commonly sold as packs of cubed belly (rather than rolled). It has recently gained in popularity, to the point where it is now frequently available in supermarkets.